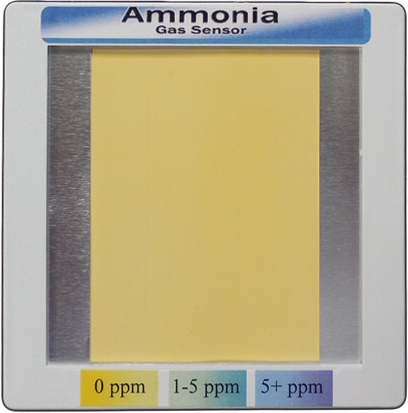 Designed to detect ammonia levels ranging from 1ppm (30 times below the point at which ammonia can be smelled) to 5+ ppm, this sensor will consistently provide the protection needed to ensure a safe, ammonia-free environment. It is constructed with a state-of-the-art, colored membrane, which changes from a canary-yellow to a deep-blue color in the presence of ammonia. Because the ammonia diffuses into and through the membrane, it does not physically change the membrane, allowing the sensor to be used repeatedly. Note – reversion to its baseline color (canary-yellow) can take an unspecified amount of time depending on conditions (e.g. variables such as the concentration and duration of ammonia exposure, air circulation, temperature). Simply mount the sensor in a window or viewing portal where room-air can freely circulate on and around the card’s exposed membrane. Double-sided tape can be used to attach the card directly to a clean, dry window, or alternatively, a clip or strap can be used to affix the card to a support. Avoid touching the exposed membrane with oily hands, alcohols, and/or solvents. The rated use-life of the sensor is one year, however, long-term exposure to bright light sources, such as sunlight or high-intensity lamps may reduce this. Expiration date is provided on the back of sensor. Note – some cleaning solutions, paints, epoxies, and cigarette smoke, contain ammonia or ammonia-related compounds can result, as expected, in a color response by the sensor when exposed to sufficient vapors or fumes. Low-level leaks may signal that a larger leak is developing, and long-term exposure at low levels can be just as damaging to products as major leaks. Many current detection systems are plagued by non-functioning sensors and false alarms – expensive errors that can cause you to unnecessarily compromise your CA environment and/or risk product loss.